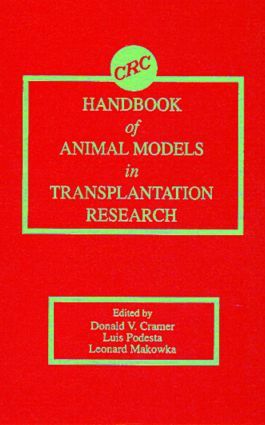 Handbook of Animal Models in Transplantation Research is a new surgical handbook that provides detailed information concerning the transplantation of a variety of tissues in experimental animals. The text provides a practical guide for experienced investigators to develop new surgical transplantation models for application in a laboratory setting. Each chapter gives consistent descriptions of the anatomical considerations, the surgical model, and potential applications of the procedure. The organ systems covered include the heart and/or lung, liver, small bowel, kidneys, and bone marrow. The species selected for representation of each experimental model is based upon the usefulness and frequency of the model for studies in transplantation research. This book is important for all experimental surgeons, transplantation biologists, and students of surgical research. "This book is an excellent reference for anyone interested in transplant research…a good investment." Introduction (L. Makowka, D.V. Cramer, and L. Podesta). Kidney Transplantation: Renal Transplantation in the Rat (M.H. Sayegh and E.L. Milford). Renal Transplantation in the Rabbit (W. Lopatin, H. Noguchi, and L. Makowka). Kidney Transplantation in Yucatan Miniature Swine (T. Howard, C.A. Cosenza, D.V. Cramer, and L. Makowka). Liver Transplantation: Liver Transplantation in Mice (S. Qian and J.J. Fung). Orthotopic Rat Liver Transplantation (M. Knoop, R. Steffen, D.V. Cramer, and L. Makowka). Liver Transplantation in the Dog (C.E. Broelsch, L. Stevens, and J.B. Piper). Liver Transplantation in the Pig (D. Kahn and R. Hickman). Liver Transplantation in Primates (O. Imventarza, H.L.R. Rilo, A. Oks, J.J. Fung, and T.E. Starzl). Transplantation of Hepatocytes (A.A. Demetriou, J. Rozga, and A.D. Moscioni). Pancreas Transplantation: Whole Pancreas Transplantation in the Rat (M.J. Orloff and M.S. Orloff). Isolation of Pancreatic Islets for Transplantation Studies (C. Ricordi). Heart Transplantation: Heterotopic Heart Transplantation in Rodents (F.A. Chapman, D.V. Cramer, and L. Makowka). Heart, Lung, and Heart-Lung Transplantation in the Dog and the Pig (R. Saito and P. Waters). Heart Transplantation in Primates (D.K.C. Cooper, Y. Ye, and M. Niekrasz). Small Bowel and Multivisceral: Multivisceral Transplantation in the Rat (N. Murase and T.E. Starzl). Intestinal Transplantation in the Rat (D.R. Grant, R. Zhong, and R. Black). Multivisceral Transplantation in the Pig (L. Podesta, D.V. Cramer, and L. Makowka). Bone Marrow and Graft-Versus-Host Disease: Bone Marrow Transplantation and Graft-Versus-Host Disease in Mice (R. Korngold). Bone Marrow Transplantation in Dogs (H.J. Deeg and R. Storb). Bone Marrow Transplantation in the Pig (D.H. Sachs, P. Guzzetta, C.V. Smith, K. Nakajima, and A. Mixon). Xenotransplantation: The Use of Xenografts in Experimental Transplantation (D.V. Cramer and L. Makowka). Immunosuppressive Agents: The Use of Immunosuppressive Agents in Animal Models of Experimental Transplantation (C.A. Cosenza, D.V. Cramer, and L. Makowka).